As any owner/operator or fleet manager knows, when a truck is down, so are profits. Getting that vehicle back on the road in the shortest time possible is a top priority. If it's a collision that's put that truck out of service, New Castle Truck & Trailer is the trucker's choice for fast, professional bodywork. At New Castle Truck & Trailer we are committed to providing our customers with the highest quality workmanship and products possible. We service all Recreational Vehicles - All Trucking & Fleet Vehicles - All Horse Trailers - Professional RV Collision Repair - Fiberglass Front & Rear Cap Replacement - Windshield Replacement - Fabrication - Aluminum Skin Replacement - Side Wall Repair/Replacement - Hail/Wind/Sand Damage Repair - Custom Paint Work: (Including Complete Paint - Accessory Paint - Custom Stripes - Spot Paint) - Roof & Rubber Roof Replacement & Repair. From a dented fender to a rollover, New Castle Truck & Trailer employs the very latest repair techniques and equipment to get your vehicle back on the road in the shortest time possible. After the completion of all body work on a vehicle, a team of professional paint specialists apply the final step in returning it to like-new condition. Our 680 sq. ft. paint booth with its 17-foot ceiling height allows for painting of large trucks, buses, and large motor homes. From delivery trucks to the big rigs, we can handle virtually any vehicle--foreign or domestic. Computerized access to parts suppliers around the country ensures that we can acquire the right parts to fix your vehicle fast. You can be assured that the job will be done right with “Maximum Performance with Minimum Downtime”. When commercial or school buses sustain collision damage, no matter how minor, it takes specialized equipment and technicians to make the necessary repairs. At New Castle Truck & Trailer we guarantee that every bus repair is done with both appearance and safety in mind. You say that your Class ‘A’ motor home was just rear ended and you don’t know where to have it repaired? Bring it to us. Our large repair facility can handle any size job. We’ll restore it to original condition and have it ready for your next big road trip. We also do installation of Langeman truck bed liners and Tommy Gate lift systems. We are a factory trained dealer for Reflex Spray-On Truck Liners which has become the premium brand for pickup truck owners who want the best. Reflex stands alone as an engineered, professional grade product. Applied as a thick, durable polyurethane membrane, Reflex has little in common with off-the-shelf protective coatings. Because Reflex cures in just minutes instead of hours, this product is only offered by licensed Reflex dealers using state-of-the-art machinery. Lifts for pickups and medium trucks, flatbeds, cargo vans. Tommy Gate's Pickup Lift Series lift gates are specifically designed to fit today's popular models of full-size work pickup trucks (models are available for compact pickup trucks as well). Tommy Gate Pickup Lift Series lift gates are compatible with many frame-mounted receiver-style hitches. Cargo vans and Sprinter vans are also used as work trucks. For those applications that need a lift gate for lifting and lowering assistance, Tommy Gate offers two different models for cargo and Sprinter vans. Options available for flatbed, cargo van, medium truck and more. Maxon offers low-maintenance Mighty Max liftgates for pickups and other Light-Duty applications, to the most capable and sophisticated column lift available on the market today. Maxon’s Mighty Max 1300 and 1650 liftgates are designed to provide easy, safe, and cost-effective lifting of light to moderate loads. 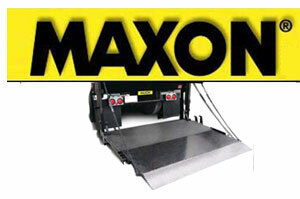 Mighty Max is ideal for trucks, stakebed, and van bodies. All of Maxon’s Mighty Max liftgates are built with high performance and low maintenance in mind. Separate yourself from the pack with professional lettering and graphics. Your truck or trailer can sport that customized look that tells everyone what you’re all about. From simple lettering on the door to a complete landscape scene on a trailer, New Castle Truck & Trailer can turn your vehicle into a true work of art.